Despite the fact there is snow on the ground in parts of the country, it is ~officially~ spring. If luck is in our favor, March will get its act together and go out like a lamb as it dang well should. If you've been cooped up in your home due to Elsa's wrath, it would stand to reason that you're dreaming of sand and surf. Island time sounds pretty ideal right about now, doesn't it? If I've piqued your interest, let me add another layer of excitement to this mirage: imagine you're not only in the ocean, you're on a pink convertible pool float. California-based company FUNBOY is to thank for this exceptional product It specializes in luxury summer essentials with an emphasis on, you guessed it, pool floats. In fact, FUNBOY kind of has this market cornered — if you have seen a cute pool floaty in the past few years, chances are the company is behind it. It provides most of the floats sold in the home section of Urban Outfitters, and has been an integral part of celebrity pool parties since its inception in 2015. Their most notable appearance to date is probably the notorious swan float belonging to Taylor Swift. Who knew there was even a market for exorbitant pool accessories? It's 2018, stranger things have happened. The pink convertible floaty brings to mind images of the rubber-clothed Polly Pocket and Barbie dolls that littered the floors of your childhood bedroom. It is the size of a queen-sized bed, has not one, but TWO cupholders, plus an enormous front cooler for ice, drinks, snacks, speakers, or whatever else you can think of. The best part? You don't need to borrow a leaf blower to inflate the thing — it's easily done using your run of the mill blowdryer. Sounds perfect, no? The one downside is the large price tag. At $128, you might have to save up if you want to (pool) party like a rockstar. If that seems like a hefty price for floating, take solace in the knowledge that, through a partnership with the nonprofit Raincatcher, each float purchase provides one person one year of clean drinking water. Sound like an unlikely pairing? The FUNBOY website explains, "As children we played in it and learned to swim in it. Water is foundational, a necessity, crucial to our daily lives and yet as a resource, often overlooked." Since spring break just ended, your bank account may be looking a little barren. If this is the case, fear not. The pink convertible is far from the only cute floaty on the market. FUNBOY specifically offers plenty of them, suitable for every budget; including four different colored swans, a unicorn, a flamingo, and a seahorse, all of which cost $79. If you're just looking for something to keep your drinks afloat, FUNBOY also carried a number of floating bars for around $40. BigMouth Inc. is another manufacturer with a hand in the pool floaty market. Their designs include countless food-themed floats, as well as unicorns, octopi, and dinosaurs. 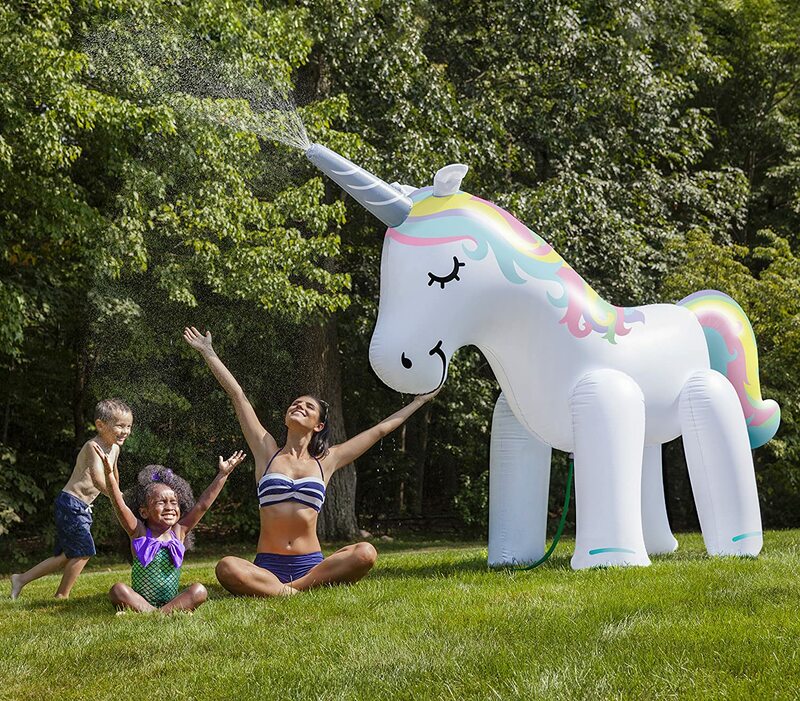 If you're feeling really adventurous you could also opt for the six-foot tall inflatable unicorn sprinkler; when I was younger and spent every summer running around my yard through the sprinklers I would have LOVED this. Most of BigMouth's products can be purchased on Amazon, with many also available through Prime. If you have your heart set on the pink convertible (which makes sense, it is pretty incomparable) all of FUNBOY's products are available on their website, with many also being carried by Urban Outfitters. We're only three or so months away from the start of summer, who says it's too early to start planning a pool party?